Small pivots aren’t enough to fix the social network’s toxic atmosphere and troubled business. It needs a much more drastic plan. Times are tough. Your stock price has tanked, your old CEO resigned, and it’s unclear whether your new one, Jack Dorsey, is a savior or a gravedigger. He’s laid off hundreds of your employees and plans to let users tweet blocks of text much longer than 140 characters. Just Sunday, four of your top executives announced their departures, and Dorsey said he wants to overhaul the board of directors. Twitter, you remain the epicenter of the Internet’s marketplace of ideas, where the famous and the unknown can mingle and interact. Yet your recent history, with its flat user growth and degenerating discourse, feels like a cross between the tragedy of the commons and a cafeteria food fight. 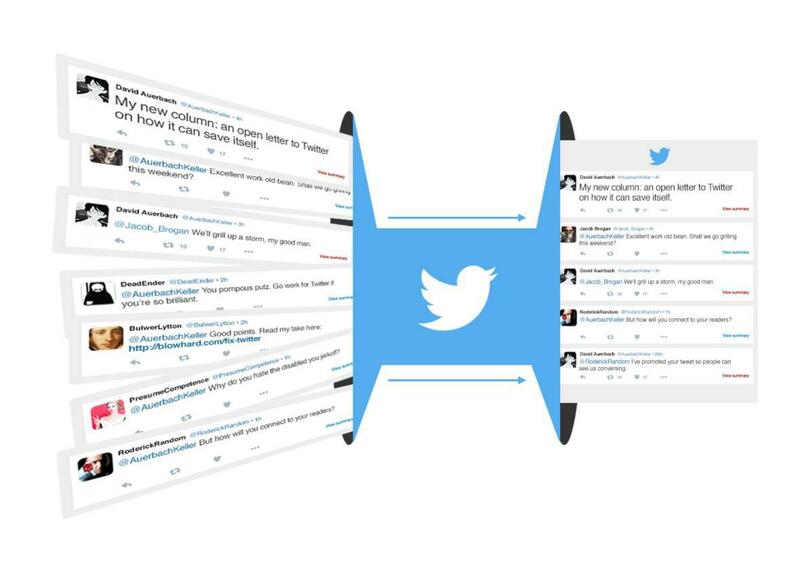 You need a better vision for your product, but first you need to fix the Twitter experience. I have a soft spot for you, Twitter, and I know none of this was your plan. The openness and public nature of discourse on your platform make for happy accidents that I could never find on Facebook, like the imaginary cities of @oniropolis and the epigrams of @MKupperman. But the arrangement of your network also leads to a surfeit of unhappy accidents, from insults to death threats. Author James Gleick had it right recently: The best way to use you, Twitter, is to surf the zeitgeist gently and watch a handful of people, not to use it as a conversational platform. But most people use your platform the wrong way, hoping to have positive social experiences. And that’s partly on you. You have the power to save yourself, Twitter, but it will take a lot more than layoffs and iterative tweaks. It will take a fundamental change to the Twitter experience as it stands. There’s a way to transform Twitter from a seagull into a dove. First, Twitter, a hard truth: You can’t fix the “harassment problem” your critics constantly say you allow to fester—at least not in your current form. For one, the very format of your network, as I’ve observed in the past, brings out both people’s worst selves and their persecution complexes, leading to polarization, herd mentalities, and the worst sort of tribalism. But even if you do meaningfully ameliorate harassment on the platform, as you’ve tried to do through faster moderation and improved filtering, you still can’t win. Part of this owes to the vagueness of the term Internet harassment, which groups everything from stalking to name-calling under the same unhelpful umbrella. According to an oft-cited Pew poll that declared that 40 percent of Internet users had experienced harassment, the two most common forms of Internet harassment are “name-calling” and “purposeful embarrassment.” Not only did this definition belittle those who suffer serious, long-term persecution online, but Pew’s broad definition pretty much brands everyone who has ever lived both a harasser and a victim. (In fairness to Pew, the poll breaks harassment down into more and less severe forms, but the 40 percent figure and Pew’s overly broad definition is what people took from it.) No matter how much harassment you banish, by some definitions it won’t be enough. In Bluebeard, Kurt Vonnegut wrote that “the human condition can be summed up in one word, and this is the word: Embarrassment.” Yes, Twitter, you are being blamed for the human condition. Some commentators even want you to fix it. I think I could hear Twitter’s head of trust and safety, Del Harvey, cringing in Wired’s recent roundtable on harassment after the Electronic Frontier Foundation’s Nadia Kayyali suggested that social networks shame their users with pop-ups into behaving better. But turning you into the Shame Network won’t save the company. You and I both know better: Twitter already is the Shame Network. Name-calling, ridicule, embarrassment, and shaming now constitute cycles in your circle of life. That’s why you need to rethink yourself from the ground up. Start with an information network of tweets and retweets but no replies or mentions as we currently known them. Twitter users would see what their friends post and retweet and subscribe to people they find through retweets or hashtags. Already, things are a lot better. You don’t encounter anyone beyond the filter of your list of friends unless you search a hashtag. If a hashtag fills up with crap, you avoid it. The replies and mentions are where the trouble starts, since that’s where the riffraff can insert themselves and cause misery. Our goal here is to prevent new, unwelcome entrants into a Twitter conversation. So replies need to be split into two categories: friend replies from your Twitter connections (and perhaps their connections), and rando replies from people outside your connections. The friend replies would be immediately visible to users and anyone viewing the thread. The rando replies would hidden away under a “See Rando Replies?” box, perhaps carrying a big warning sign. If a user wishes to see how the great unwashed masses are responding to a tweet, she can, but by default, she won’t see any of it. In addition, users cannot reply to rando replies—at least not directly. A Twitter thread will revolve around the original tweet; it will not spin off into a careening conversation dragging the original tweeter along with it. @AuerbachKeller: My new column: an open letter to Twitter on how it can save itself. @Jacob_Brogan: @AuerbachKeller Excellent work old bean. Shall we go grilling this weekend? @AuerbachKeller: @Jacob_Brogan We’ll grill up a storm, my good man. @DeadEnder @AuerbachKeller You pompous putz. Go work for Twitter if you’re so brilliant. @PresumeCompetence: @AuerbachKeller Why do you hate the disabled you jerkoff? @RoderickRandom: @AuerbachKeller But how will you connect to your readers? @AuerbachKeller: @RoderickRandom I’ve promoted your tweet so people can see us conversing. Thus, Twitter users would curate the replies to their own tweets—but only if they were willing to shoulder the unpleasantness. This would preclude the infamous Twitter dog pile by dividing responses into verified, high-quality replies and unverified, low-quality ones. By restricting the easily visible conversation around a tweet to a limited set of participants, the conversation would become more information-rich and less noise-ridden. And it would be up to the individual to judge what noise to allow into the conversation. Mentions—that is, when people spontaneously mention or @ you rather than replying to one of your tweets—have to go. A user can still mention friends, and perhaps friends of friends, but a mention of any other user will not alert that user. If I start talking about @Drake, the only way he would find out would be if he (or his handlers) enter his carefully marked garbage heap. If people need that ego gratification so much, they’ll know what risks they’re taking. Will this kill open discourse? To a point, it will, though the walls between cliques of people will still be far more ad hoc than they are on Facebook. There will be a higher bar to new, random connections between people. But open discourse (which easily leads to dog-piling and harassment) isn’t really in fashion right now, and if you want to survive, Twitter, you will have to make a structural compromise between polite walled gardens and freewheeling anarchy. Most importantly, you need to create a new situation in which the worst of your network is hidden by default. The default Twitter user experience should feel more predictable, more polite, and less loud. And to those users who go beyond the defaults and still complain that Twitter has yet to change human nature, you’ll be able to respond: You were warned.